Eva is one of our favorite restaurants in SLC (dare I say, possibly even our favorite, considering the price and quality). This is sophisticated, carefully-crafted food for a ridiculously inexpensive price. We recommend going for Saturday brunch and trying the loukamedes, which are delicious pieces of heaven (kind of a mix between donut holes and beignets). And for brunch, also go for the brunch pie (ham, gruyere, and egg pizza pie topped with hollandaise). Dinner at Eva is every bit as delicious. On weekends, it’s packed, and they don’t take reservations for parties under 6, so if you’re looking for a romantic, candlelit dinner-for-two in this tiny European-style restaurant, come early and put your name down. For dinner at Eva, we always go nuts. It’s so inexpensive, we end up getting a good mix of small and large plates to share. The most important thing for you to know: order the tri-tip bruschetta. It will revolutionize everything you thought you knew about bruschetta. Served with good slices of parmesan, aioli, and radicchio, it’s savory, tangy, rich, and perfect. Another must-try is the oddly named dish, Oink, Oink, Oink. The important thing to note is that it’s three different kinds of pork: succulent pork belly, pork loin, and bacon, served with candied garlic and a celery-apple salad. The Greek mac and cheese is another favorite. You can’t go wrong with homemade mac and cheese with bacon, all wrapped in a flaky phyllo pastry. The lobster ravioli (served with mushrooms and shrimp) and the spinach and potato gnocchi (served with a truffle oil white wine cream sauce) win for the best pasta dishes here, both rich and creamy. We haven’t had much at Eva that we haven’t liked, but there have been a few duds. We’ve had glazed pork ribs with arugula and almonds, and they were mediocre. The well-marbled pieces on the bottom were excellent, but the pieces on top were dry and overcooked. Additionally, Eva is not a place for dessert. Eva’s the go-to place for decadent brunches and dinners. We’ve ordered three desserts here, all of which were completely unimpressive and underwhelming. So skip the dessert and order an extra small plate instead. 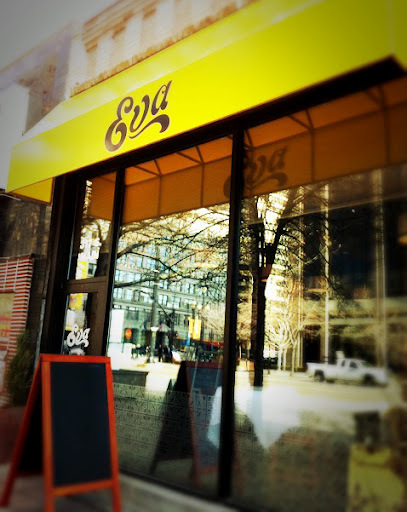 Eva is located at 317 S Main St, SLC. Visit http://www.evaslc.com/ for more information and to peruse their menu. WARNING: I’ve gotten feedback from people who’ve said they’ve repeatedly gotten awful service here. While I’ve never had awful service, I’ve certainly never had excellent service. As a rule, the place is packed on weekends and you have to set aside quite a lot of time for dinner. Generally, weekdays and Saturday afternoons are better.